HaliTonic is 100% homeopathic remedy designed to relieve the embarrassing condition of halitosis (bad breath) as well as to promote your oral health and maintain the natural cleansing mechanisms in your mouth and digestive system. It is safe, non-addictive and natural but it does not actually cure your halitosis – it only temporarily reduces its worst symptom – bad breath. Because it is taken internally, it is said to help maintain the natural cleansing and detoxifying processes in your digestive tract, thus making your breath smell fresher. As a homeopathic formulation, it is safe for all ages as well as pregnant women and breastfeeding mothers. What’s in Native Remedies HaliTonic? Kali phos 6C HPUS – for the reduction of bad breath and treatment of gums that bleed easily. Silicea 6C HPUS – treats gum boils and abscesses that form at tooth root. Nat sulph 6C HPUS: helps to eliminate or prevent the formation of slimy, thick mucus in the oral and nasal cavities, as well as treat blisters on palate. 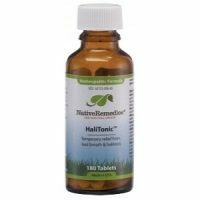 How do you use Native Remedies HaliTonic? Dissolve 2 of the small tablets in your mouth 10 minutes after eating, or 30 minutes after brushing your teeth. You can repeat this 2 to 4 times daily, but you should not exceed the recommended dosage of up to 8 tablets per day. For children or small babies, you can crush the tablets and sprinkle this on to their tongue. The tablets do not contain any artificial colors or preservatives. 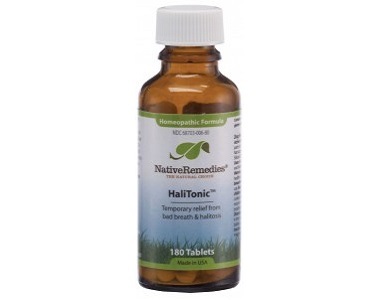 A bottle of 180 Native Remedies HaliTonic tablets costs $39.95. However, if you buy two bottles, you qualify to get a third bottle free. With 180 tablets in a bottle, this should last you at least 22 days, depending on how often you use them. The Native Remedies website has a coupon which enables purchasers of any of their products a 15% discount on all orders. Orders of over $59 also qualify for free shipping. We were unable to find any indication of a guarantee for Native Remedies HaliTonic. This could be problematic if the tablets don’t work for you, or if you find their taste too unpleasant, especially if you have bought more than one bottle to take advantage of the special pricing. Like all Native Remedies’ homeopathic products, HaliTonic is manufactured in a FDA-registered and cGMP (Good Manufacturing Protocol) compliant facility. This process is monitored by qualified homeopaths and pharmacists, using ingredients that are listed in the Homeopathic Pharmacopoeia of the United States (HPUS). As a homeopathic product, the ingredients are all natural and there are no artificial colorants or preservatives. 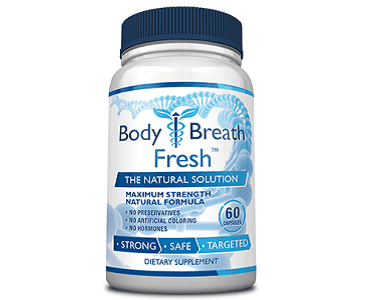 However, we were concerned at just how effective the tablets could be – especially in view of the fact that the manufacturer stipulates that it only provides “temporary” relief from bad breath. There is no indication of how long that “temporary” relief will be. In addition, we were concerned that the manufacturer does not appear to offer a guarantee on this product, so if you don’t like it, or it doesn’t work for you, you won’t be able to get your money back or return any of the product you have not used.